Normally I wouldn't try on an entire collection in one day. I would swatch them on swatch rings and add them to my spreadsheet. I knew I was going to do the Bliss Kiss hydration for three days starting this evening I decided to go for it because I just couldn't wait to see them on! Wet N Wild Ghouls Rush In is a berry pink creme with a near jelly finish. A crelly! It's super shiny and so pretty. I adore this type of pink. I have so many and keep buying more. Gorgeous. It applied well. This is two coats with top coat. 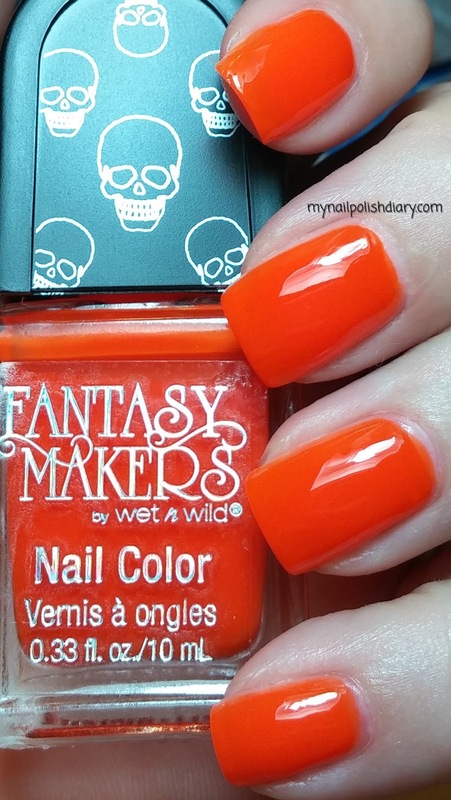 Wet N Wild Goosebump Suit is a Bright medium orange with a crelly finish. Super shiny and slightly squishy looking. It applied easily. This is two coats with top coat. Wet N Wild Queen Of Envy. What a great name. When I saw the name I immediately thought of Scarlett O'Hara in Gone With the Wind saying: "I want eveyone who's been mean to me to be pea green with envy." :D Queen Of Envy is another crelly. It applied nicely though with three coats it's still not opaque. I still have visable nail line. Might be one to use underwear with if the VNL is bothersome. This is three coats with top coat. 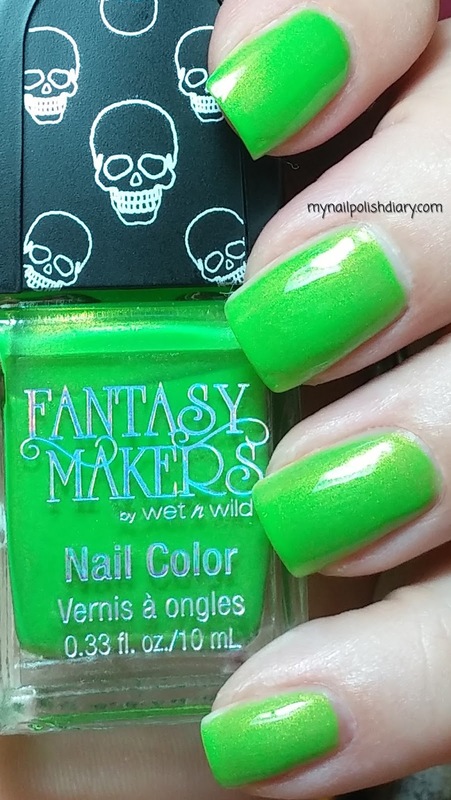 Wet N Wild Fantasy Makers Roach Busters. Like Ghost Busters maybe? 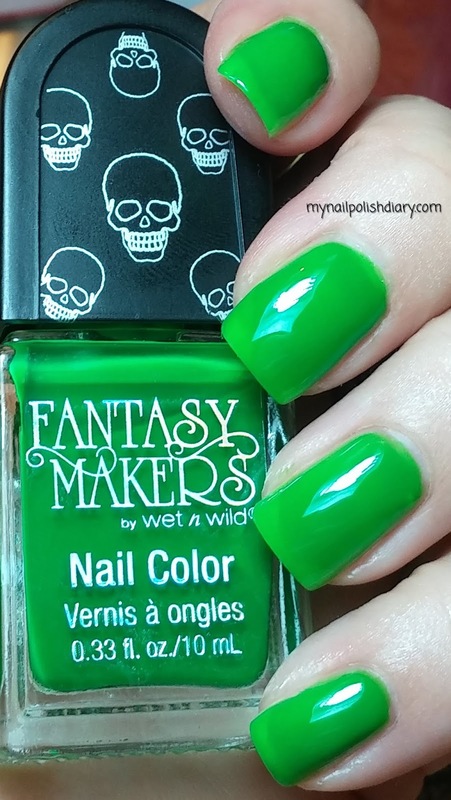 Roach Busters is a light green with silvery shimmer. I quite like this one. I don't know when I'll wear it but nonetheless it's pretty. This is two coats with top coat. 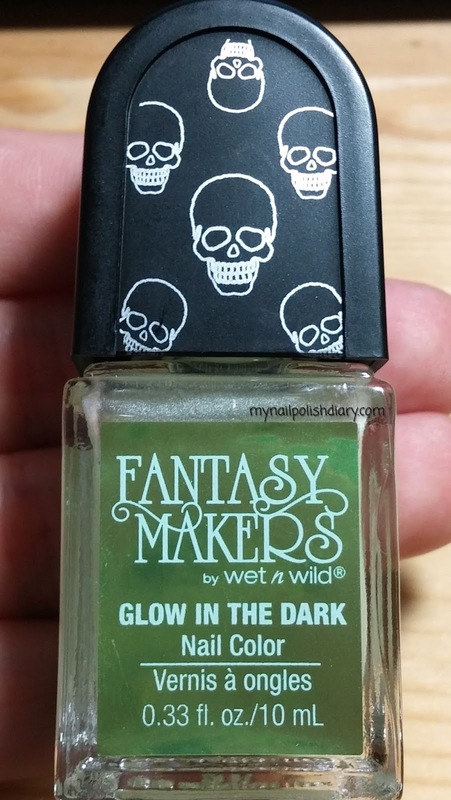 Wet N Wild Fantasy Makers Witch Black. Oh my grits n gravy this is gorgeous. I love a vampy color any day and when it's this shiny...omgosh...I die a little. Witch Black is a black creme that is so shiny! It applied easy. This is two coats with top coat. This collection is adorable and I love displaying the little tombstones on my shelf of unique polish bottles in my Princess Room. I think I may need Goosebump Suit!